AMAZING GRACE, AMAZING GOD, AMAZING LOVE – and an irritant named Satan…. My sincere apologies at not blogging for a few days. Many reasons, not the least of which has been extreme exhaustion at the end of the day, with countless numbers of people both prayed for, healed, or the happy recipients of a miracle – and there have been quite a few of those…. When you get Caleños – people of Cali – saying that weather is very hot, then you know it’s just not us pasty, sunlight-stricken Brits, for the most time, that are finding it draining. Generally, at this time of year, the mid-afternoon temperatures are 28-32C. This time, they’ve averaged around the 36-38C mark. Not a huge difference, you might think, until you come to do anything. Normally by now – 2 weeks into a trip to Cali, I’m pretty well adapted, and not finding it a hard to keep moving. This time, it’s a whole new ball game! There are other contributing factors to the lack of blogs. I can’t go into any detail, obviously (as you’ll see why when you finish this paragraph! ), but a ‘situation’ arose during the April visit which was, to say the very least, unfortunate, one that should never have happened, and, I pray, never happens again. No details, sorry, but a church in this lovely south-west part of Colombia, has ended up devastated, it’s like a human earthquake hit the church, and it’s going to take a long time for that church – to recover. As the ‘leader’ of the teams that I bring here, I felt I needed to do two things: firstly, to apologise to my dear friend, Pastor William Castaño, who organises much of my (excellently and packed) programme here, and to offer not to return here again myself, or with teams, as ultimately I’m responsible, having invited people to join me, even though the actions of others can never be accounted for. Secondly, to see the Pastor of the church, with William, and Pastor Wilmar Gomez, to offer the deepest apologies possible, and I made the same offer to him, to step away from Colombia. William nailed his colours to the mast, on my account, by asking me to speak that morning, before going to the church, to a fantastic group of pastors. For me, it was such a blessing, to know that a man of William’s stature in the Christian world here and in other parts of South and Central America, effectively ‘endorsed’ me. It was a great way to begin what were going to be a tough few hours. There must have been 25 pastors present: Wilmar translated for me, and prayed, as we saw God instantly heal about a dozen of them, from osteoarthritic knees, backs, ankles: carpal tunnel syndrome: chronic back pain, and all the usual suspects…. Then to the church: the first little while was tough, the sorrow and devastation of the Pastor & his wife, evident in their faces. I did the only things I could do, as I’d done with William. Both were graciously considered, and no, I didn’t need to quit as the situation appeared so cut and dry. It was with a huge sigh of relief that I sat in the back of William’s car on the way home, and sadness both for the victims of the situation – the church – and got those involved in it. I’d only heard from Wilmar about this situation the night before I flew to Cali. In the last blog, I mentioned I’d had – or rather, my amazing team had mentioned – a strange ‘turn’ that I’d had last Friday. Subsequent conversations with my dear friend, Lee Collier, who’s been here two or three times before with me, and is a doctor – as his his wife Katy – suggested something different: Lee was concerned enough to ring, and, actually, Id wondered the same thing as the ‘turn’ was happening: to suggest it just MIGHT have been a TIA (transient ischaemic attack – a mini stroke…. I haven’t yet checked it out with a doctor, and nothing even remotely similar has happened since…..but it was most definitely an attack of the enemy, to rock the boat even more than it had been rocked by the events of April. Sleep became an increasingly distant friend as my head could not put the April situation down (I slept 29 hours in my first 14 days here), it was, although resolved with the necessary people, it still ran around in my head… I do think now, in the light of sleeplessness, heat, and ‘busy-ness’, along with an enemy who is not in the least pleased with what God’s doing here, that everything combined together to try and ‘side-line’ me. I ain’t having that!!! I want to say more about this amazing team I’ve got here this time in another blog, but I am absolutely blown away by who they are, how they’ve been, what they’ve done, and their sheer adaptability not only to an ‘alien’ city, the heat, and the altitude, but to what God is doing in them and through them. I’m blessed, as always, to have great people with me! Oh yes… nearly forgot… the old weight is still continuing, after 45 years of failed diets, to still fall off me….! 37 kgs, a tad under 6 stone in proper money: the heat’s combining with every else to do me a favour!! Yeahhh!!! Weird and (not so) wonderful…! Yesterday, we were due to go to a very poor part of the city, where there’s a large community of street people, all alcoholics, druggies, etc… I’ve been before, a lovely lady doctor, Ana Bustos, takes food to them every Friday. Sadly there was confusion over just where it was.. all the streets here are numbered, ‘streets’ (calles) go one way, and roads (carreras) the other. And many are very, very long…. so it’s pretty inportant not to get yer calles and carreras wrong! Yesterday, it happened: we SHOULD have been directed to Calle 44 with Carrera 2da. Instead, the guys got taken to Carrera 44 with Calle 2 – a totally different part of the city…. BUT… they went to ‘Reconocer’, the Christian Drug Rehab centre, run by my good friend Enrique Leal. I’d planned for just Caroline and the Irish guys to go, and they had a great time, praying for all of the ‘recoverees’, one who gave his life to Jesus. Reconocer is a wonderful place (formerly a house owned by the Rodriguez brothers, the second largest cartel in the world at the time, now ‘redeemed’ as a drug centre!). 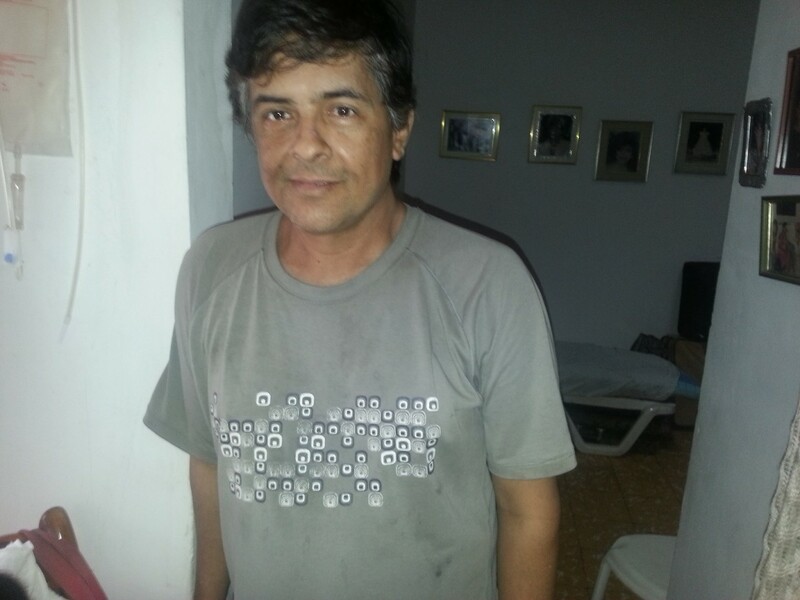 Enrique loves the residents with a passion, and the presence of God in that house is tangible. My little team of troupers loved it…. Then, home: it’s been blisteringly hot here this trip, and, though I drink litres of water a day here, last night was a bit odd…. I’ll let the guys write the next bit, as I really don’t recall much of it…. On our arrival home we were excited to tell Paul about our time at the rehab, although as he approached the sitting area we were unsure what was going on as he seemed to be staggering towards us rather than walking. His first sentence was more of a blubber, and sounded something along the lines of ‘asdfghj’ (if you try to pronounce it – it’s probably similar to what Paul said) in response we all erupted into laughter, after his second and third attempt to speak we laughed so much we were almost crying. However, soon after we began to wonder if something was wrong or if Paul was drunk, and the laughter faded. Grace and Pete were convinced Paul was having a stroke, and we all began to worry, but still giggling in between the laughter. I suggested Pete should get Paul a drink of water and when he went into give Paul the drink he appeared to be asleep on a little wooden chair, and again he said ‘tgjhv’ at which Pete laughed and handed him the water, the change was almost instant and it became clear that Paul was neither drunk or having a stroke, but was in fact just dehydrated, PHEW! I drank water during the day… but never would I have believed that dehydration would hit so quickly or so bizarrely….. never been dehydrated before, hope never to be again! Yesterday, Pastor William took us to pray for a lady, Esperanza (Hope), who has an amazing spirit, incredible faith, and really and truly, should be dead. Cancer of the larynx began it all spread to everywhere, literally: Caroline & I ha a wonderful time praying with her, no visible transformation, but incredible rising faith…. The astonishing miracle though, was of her son Jorge. It wasn’t yesterday, but a year ago in the church Dios con Nosotros, where Jorge was one of the worship leaders. He and his mum had moved to a church close to their home as Dios con Nosotros is a long way south, as they were both too ill to travel. Jorge had Type 1 Diabetes, and was in a very bad way with that, the doctors said it wouldn’t be long before it killed him. To make matters worse, he had very bad cirrhosis of the liver, which was also killing him…. As often happens, I never heard anything – until yesterday. Jorge greeted me with a huge hug …. totally healed, almost instantly as it turns out, of both the diabetes and the cirrhosis. The diabetes went the way of most supernatural healings, in that his blood sugar levels changed and his pancreas was either healed, or replaced supernaturally, by God. The cirrhosis, however, was an altogether different ‘healing’ – one of those ‘events’ God still uses to keep me astonished even after all these years! Jorge felt rather unwell, a little dizzy, and nauseous…. then (if you’re squeamish, you might want to miss a line!) vomited up a copious amount of blood….and, according to doctors, and Jorge, completely vomited OUT the complete infirmity…. and he was healed….. God blows my mind even after all of these years! More testimonies, and a massive answer to prayer! In April, in a meeting in a church in Sevilla, there was a man who’d been in an accident, and hadn’t been able to walk for 9 months. I remember him in his wheelchair: he left it at the font when he walked out. Pastor William told me Sunday he’s totally healed, and is doing great…. Monday, Wilmar was round, and we went to King David Hospital to pray for Maria Helena’s daughter, who’d had convulsions. We had a lovely time with her and Maria Helena: Vanessa isn’t in the Kingdom yet, but she felt the fire of the Holy Spirit burning her from the inside… Caroline and Wilmar talked with her for a long time, and the process of change, as well as healing, is undrway. Then we got to pray for the patient in the next bed, and her husband, a lawyer, who asked us to pray for him for wisdom… it’s amazing how open people are to prayer here….he was a lovely man. I had been trying to get hold of my friend Dario on the phone, but it was voice mail, so Wilmar has this funny thing where you can message a Blackberry, so he sent one to him. Literally, 5 seconds later, he replied….. and so, early on in this trip, we’ve managed to get together, whereas previous trips we somehow never connected until near the end. We were invited for lunch at his home, and had a wonderful time with him, Eric, Michelle (10, fluent in English!! ), and Joshua. The most privileged bit though was having him ask us to pray for the family…. it was so special. God answered Wilmar’s and prayers on the day of his surgery, when he’d blown my mind asking me to visit him in hospital as soon as he’d woken up from the anasthaetic. Can’t – won’t! – explain here WHY it blew my mind: just email me and ask if you want to know! His hug when we arrived was worth the airfare: ‘Paul, you’re in my heart all the time, I love you’ are sort of unexpected from most people with his ‘history’… it’s so clear that God is speaking to him, AND that he hears, and that God’s changing him, even in the short time since April. I really enjoy his company: what is so surreal, is that he enjoys mine…. He’s so happy I’m here again, and wants to be with me, we were invited to the ‘finca’ – the Andean mountain estate – Tuesday: with all of his close family. It was a great time getting to know some of his family better, as usual Dario was the one who introduced the whole element of praying for the sick ones! His brother had plantar fasciitis, and a hereditary bunion problem – you could see where the metatarsal had moved, and was actually forming like an ankle bunion. It hurt him to put his feet down, for some months: God healed him on the spot…..and the metatarsal must have moved, as he no longer had issues with his ankle…. Yet another case of my finding God’s sense of humour, and faith-stretching, as I’m one of the (I’m told) 2% of men who have bunions (women 47%). Personal note to self: you really shouldn’t have worn those stiletto heels for your first 50 years of life…. Lileana, Dario’s mum, had extreme pain in her legs, back, and – yes, you got it – knees: everything to do with pain went instantly, and in church last night, she stood at the front and testified to it. And, about church last night, same one as Sunday, Dios con Nosotros, Caroline did the main preachy bit…. I just shared a few things I felt God had given, and some stories to raise faith….which seemed to work, as everyone I prayed for was healed…. about 10 or so…. and Caroline had a similar story to tell…..
And the Irish contingent have arrived tonight – Carly Brown, Grace Uitterdijk Grace Uitterdijk, and Peter McAvoy…. team complete, and ready to roll….! Cali, Colombia – Home, sweet home….and the ‘motorbike’ killers strike in the next street…. And so…. having been upgraded Madrid to Cali (lie-flat bed seats….yeahhh!!!!!) I arrived to pouring rain, but the delightful Gomez family – Wilmar, Marlene, Sophie, and Sara – and Caroline, who’d stayed with them having arrived Thursday, were there to meet me, I arrived ‘home’ in Cali, for my 54th visit here. Bereft of Margrethe (only for a day or so more! ), and with the Irish trio of Peter, Carly, and Grace, arriving Thursday, we’ll soon be complete…. It was just Caroline and I who went with Pastor William Castaño, to a frequently visited church in the south, Dios con Nosotros (God with us). William preached, as he was finishing a series there, but he asked if we could go, and pray for the sick. It’s so wonderful to go to a church in another country, and have people greet you like a long-lost friend…. Needless to say, lots of people responded: Caroline happy and confident to pray in her brilliant Spanish, me using friend Johan to translate, as the first couple of days back here, it seems my Spanish gets left in England! Quite a few people were healed instantly, which is so good of God to kick us off so early in the trip. But, in the meeting, a man named Fredy testified about a lovely healing when I was there in April: plantar fasciitis, 8 months in extreme pain, could hardly walk, put any weight on his foot, totally healed…. a lovely lad, Sebastian, about 8 I guess, had had chronic tonsil and throat problems since birth. Dad told me yesterday he was totally healed…. As always, lots of knee problems: pain went from all the ones prayed for…. Dario’s mum, Liliana, acute pain in both legs, back, and neck: it all went. In two people, you could visibly see depression lifting…. and going, to which they testified before vacating the ‘hot-seat’ for prayer…. back at the church on Wednesday evening, hopefully some real firmed-up testimonies…. Margrethe isn’t going to be able to join us, sadly… her passport arrived ok, so she called Avianca, the airline, to re-schedule her ‘flexible’ (now joke!) ticket…. only one seat available in the next week, still in economy, but a different ‘seat class’ (exactly the same seats, often next to each other). Yes, she could have it: for the princely ADDITIONAL payment of US$1630…..
Well, I’ve been quiet here for a few days, partly because of the travelling, and that awful task known as ‘packing’! Even after 30 years, although I must be quite ‘professional’ at it by now, I hate it to bits! Unpacking this end is almost as bad! I’m one of those strange people who have to unpack as soon as I arrive, or arrive home, no matter what time of day or night it is. Once that’s done, I can begin to feel at home! I’m going to split the blog into two parts – so you don’t have too long a ‘tome’ to read. Thank you for reading it, by the way! I certainly don’t take your interest, prayers, and encouragement, for granted. So, just before I left Ireland last Thursday evening, I had a wonderful piece of news about the lovely Ana Beiba, who, I probably don’t need to say, runs the home for abandoned old people. If you read the blog in April when I was here, you’ll remember that she had been diagnosed a second time with cancer – first time was when I met her almost 3 years ago, then with 2 months to live: a brain tumour, which, as I and my little team prayed for her, she felt it go…. 2½ years on, it is back, not a brain tumour, but cancer of the oesophagus and throat. She looked very ill, had lost a lot of weight, and, of course, her voice (which she uses for spontaneous worship to God a great deal, and very loud!) was hard to hear. Ana Beiba…cancer of the oesaphagus and throat…gone!! and there’s no cancer there…. while rejoicing for Ana, and having seen quite a few healings from cancer this year, even after all of these years I still have unanswered questions to God as to why others don’t…. thinking especially of a lovely friend, David, who is a walking miracle, but still has the foul disease the enemy’s dumped on him….I so believe that David WILL be… IS being healed, but….. answers on the back of a postage stamp, please, as there aren’t any I can think of…..
Then, having flown into Heathrow Thursday night, my lovely friends Keith & Margaret, and I, waited for Margrethe, from Norway to arrive, as she is part of my team here in Cali. About an hour after her flight landed and baggage was up, she walked through into arrivals. One miracle happened in that hour: poor Margrethe had picked up her out-of-date passport, and somehow was allowed into England by immigration. But that meant, of course, that she was scuppered from flying with me to Cali early Friday morning. Keith and Margaret went with her to the Norwegian Embasy Friday: no joy other than offering her one flight, and that back to Oslo. A friend in Norway has posted her current one to England, but, as yet (Monday night my time) it hasn’t yet arrived. God willing, tomorrow, Tuesday, meaning she can fly Wednesday. A second miracle, a little more ‘hidden’ and unexpected HAD already happened, though. You might remember a few weeks ago my credit card was fraudulently used, which meant a 5 working day delay in buying the tickets to Cali, the time it took the bank to clear my card back to zero. When they finally did, the tickets I’d found had gone: and they cost £400 more, each: I was getting Margrethe’s as she’d wired her fare to me. Having snarled and mildly cursed the delay by the bank, there was no option BUT to pay the increased price. One of my team, Caroline, from Rouen, France, was already here, and it’d have been a little mean to leave her here alone, though she’s fluent in Spanish and has taken to Colombia like a duck to water (she’s a Spanish teacher in France). BUT….the delay, and the increase, meant Margrethe and I had moved from basic ‘no change/refund/transfer’ tickets, to flexible ones: which means that, having phoned the airline at 1 am Friday morning, to pull her off the flight, she can use it any day in the next year! Grateful for small – perhaps at £1300+ for the ticket, not so small! – mercies, or what??! !